Don't know much about these, so any advice is appreciated on value. Guy said they were both nonworking. Thanks..
pacman11 last edited this post 1 year ago. Keep in mins, since they are so large, they can be hard to resell later. For goldmine, make sure all the boards and displays are there. They are sometimes removed and installed in pins. Whats the price range on a working / non-working bowler? Thanks guys for the information..
EM shuffle alleys in fully working condition, with reasonably good cosmetics, top out in price around $500. If the backglass is cracked, broken or has substancial paint loss, but otherwise fully working, its worth $100. Backglasses are nearly impossible to find for EM shuffle alleys. Nonworking EM shuffle alleys in reasonably good cosmetic condition start out at $100. 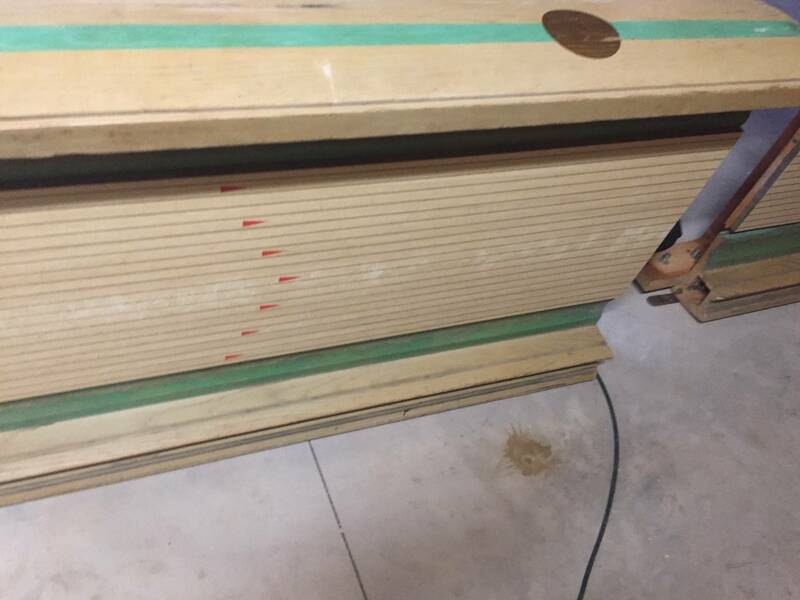 Solid State/DMD shuffle alleys in reasonably good cosmetic condition that are fully operational bring $600 - $800. Few people undertake high level restorations of shuffle alleys, simply because they will never ever sell for whats invested in them. Yes, one will see all kinds of insane prices for shuffle alleys on craigslist & ebay. They rarely sell. The ball bowlers range from $1000 to $2500 not workings. I think they are all EM style but I'm not sure. A restored one can fetch from $2500 to $4500. The range usually depends on size and manufacture. The smaller ones (like 11 foot) can bring towards the higher end since they fit inside a game room better. United brand seems to fetch at the higher end as well. 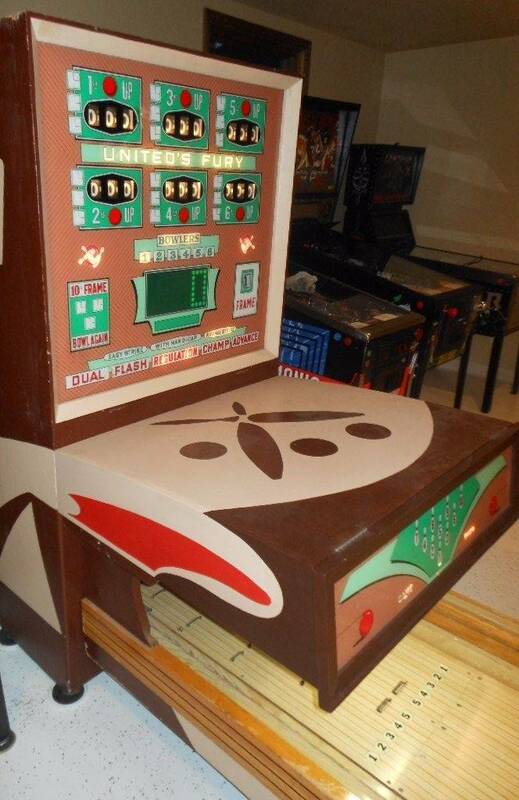 I recently sold my 16 foot, 1963 United Fury, for $3500.00. After I brought it back to life it worked flawlessly for more than 5 years in my game room. It was the most popular machine I have ever owned. Paid $400 (non working), put in another $100 for parts and some elbow grease. Some of my friends hate me now for selling. As my good friend doc doom used to say, "shuffle alleys are for pussies." Obviously he liked ball bowlers. But he was right, the amount of work required to restore a shuffle alley is about the same as a ball bowler. Yet ball bowlers are worth 5 to 10 times more! Here is my take on ball bowlers. Any ball bowler worth owning is an EM. If you see an EM converted over to solid state.....run away.....quickly. Pricing. 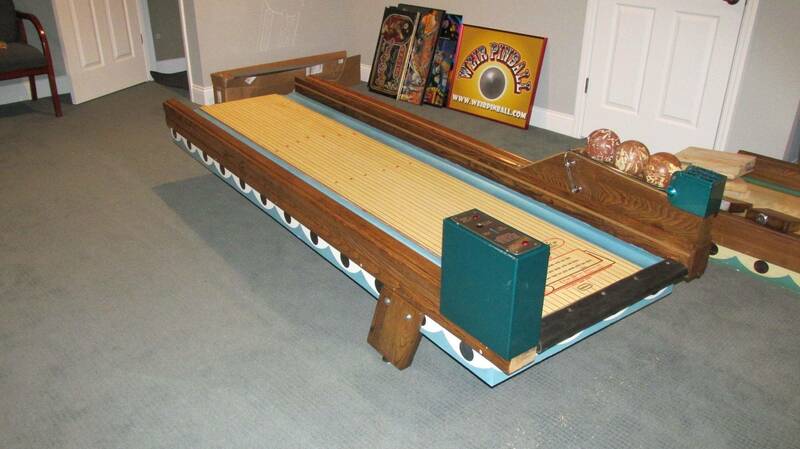 I happen to think $600 - $800 is the absolute maximum one should pay for a non restored non-working ball bowler. 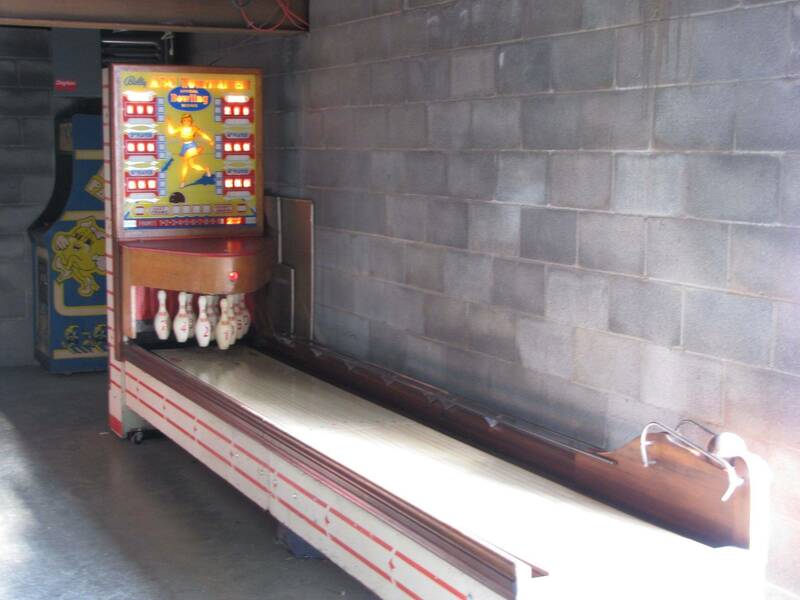 If its in storage, and the seller insists it worked fine before being put in storage, it shall be considered a non working ball bowler.....and priced accordingly. Mechanically, shuffle alleys & ball bowlers are almost identical.....obviously pucks bounce back & balls have a ball lift mechanism. 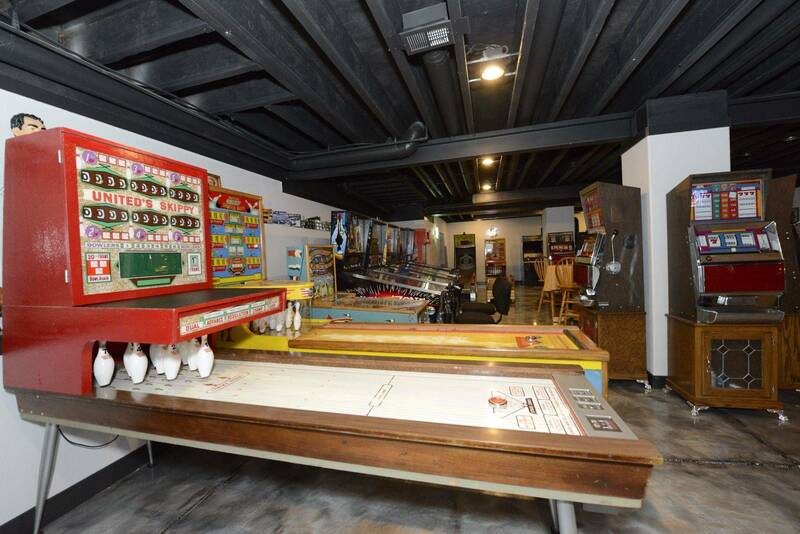 Professionally restored big ball bowlers (heavy emphasis on PROFESSIONALLY), can bring over $10K. Small ball bowlers were produced in 1956 & 1957. They are by no means on the high end of the pricing spectrum, but rather on the low end. The high end of the pricing spectrum is for 16' or longer big ball bowlers. 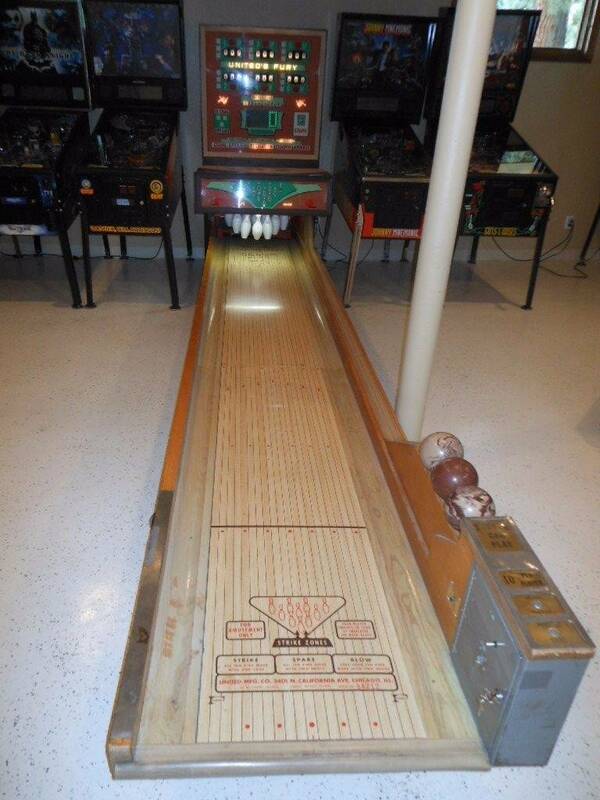 Highly sought after ball bowlers are any of the 63-69 Bally Ball Bowlers as well as the 1960 United & MBA Bowl-A-Rama. Ball Bowlers were produced from 1956 - 1973. United & Chicago Coin are the most common with Bally a far distant 3rd. There is a trade off on ball bowlers. 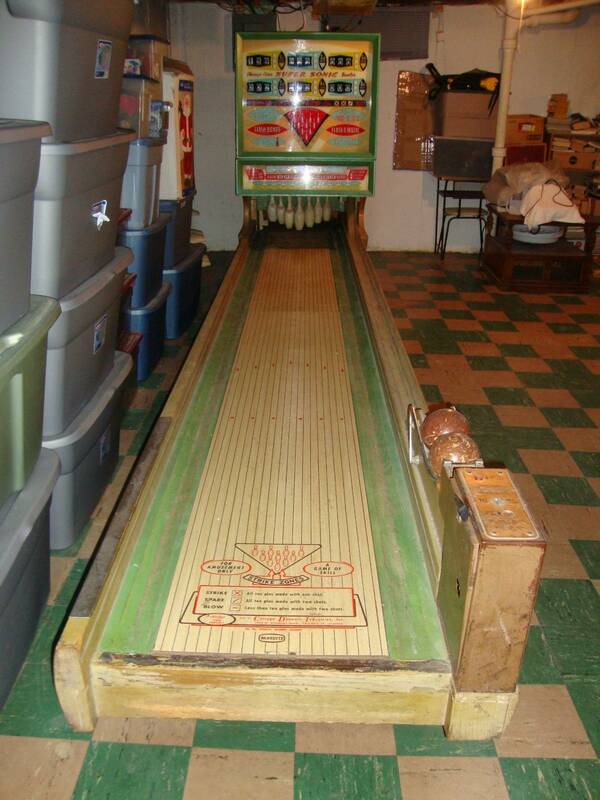 Many find the ball bowlers prior to 1961 the most desirable for aesthetic reasons. 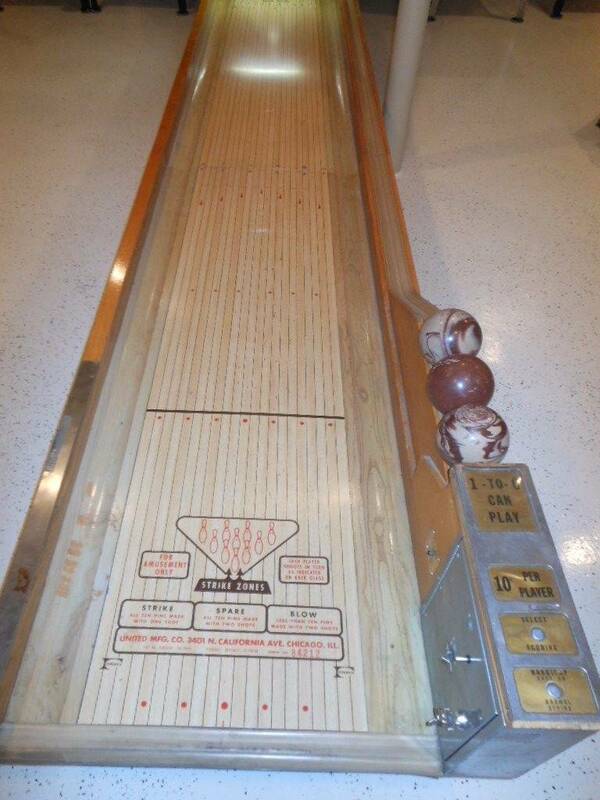 I happen to think certain Pre-1961 United Bowlers with curved pinhoods & attractive females on the backglass are tops. As ball bowlers evolved, females disappeared from the backglass, but game variations multiplied. 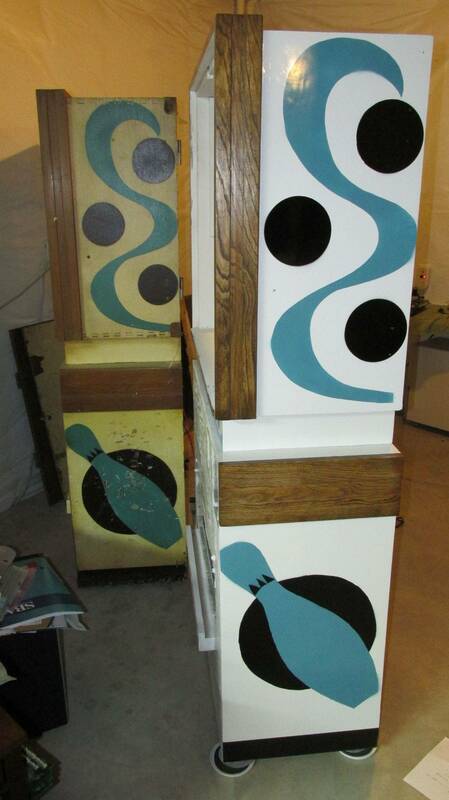 Certain models of the early 60's Chicago Coin bowlers also are very aesthetically pleasing & offer many game variations. Wow now that's a nice bowler. One of these days I'll find one and add it to my gameroom. Thanks everyone for your input now I know what I am looking for and somewhat have an idea on value. Everyone here is correct, I have had about 20 bowlers. The one I have now has only been in a home ever since new. It all depends on how well the graphics are and condition and length. Schuffle bowlers are not worth much because they are not as fun to play or as realistic as the big ball bowlers. 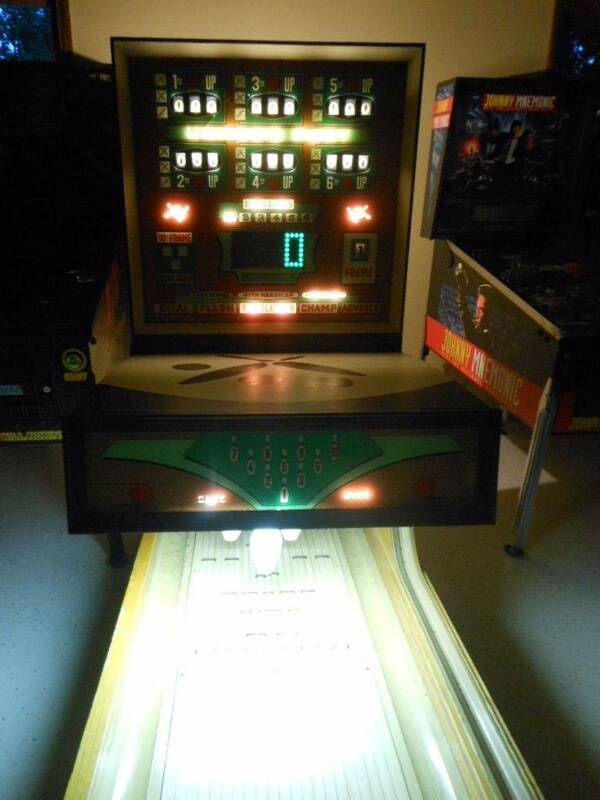 Ive been looking for a sys11 shuffle bowler too. These things are difficult to even find for sale. The ones you do see are on sites like feebay and retail sites for north of 2500 bucks. Yeah right. Wow thanks for all the info! I have two shuffle alleys and one ball (3 in.) bowler in my game room, and actually prefer the shuffle alleys over the ball bowler. Faster learning curve, and game room visitors seem gravitated to them. The ball bowler requires more skill to compete. 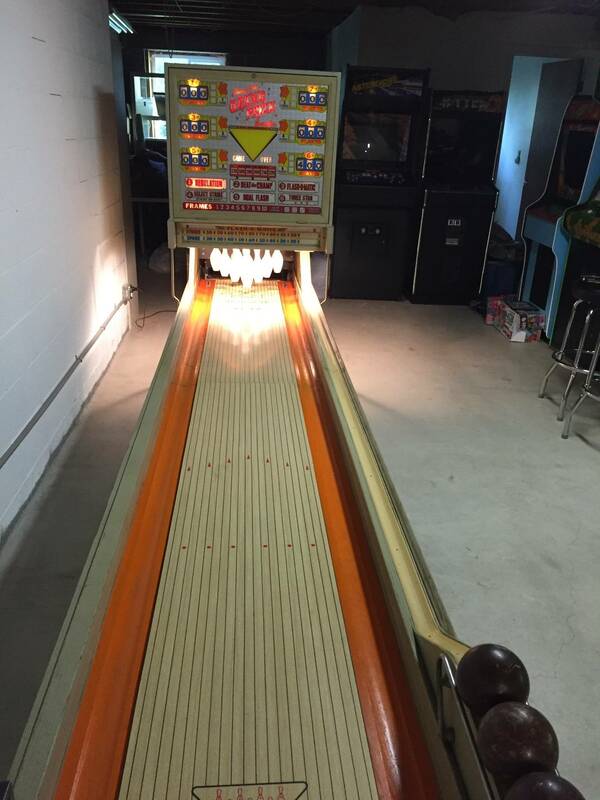 Also have a skee ball machine, 13 ft. long, which is always a crowd pleaser. As for prices on them, condition plays a major role, along with completness. They are relatively easy to get up to normal operation, but a bear to move. Values will range from clapped out machines ($100) to nice examples ($2500) with the exception of the very long, large-ball bowlers which can cost in excess of $5000. Look for one that hasn't been in a flood, that was working when it went into storage. And prepare your room for the length of it. Good advice in this thread. To each his own on preference. I personally like the CCoin bowlers from the early 60's the best. My favorite switch model is the Majestic. My favorite contact bowler that blows them all away is the MBA/Bowlarama by United. I have owned over 100 bowlers and nothing comes close to the MBA/Bowlarama. Don't get me wrong, the switch style has some fun games you can't get on a contact bowler like Flash and are definitely worth owning but once you play a Bowlarama it's all over. 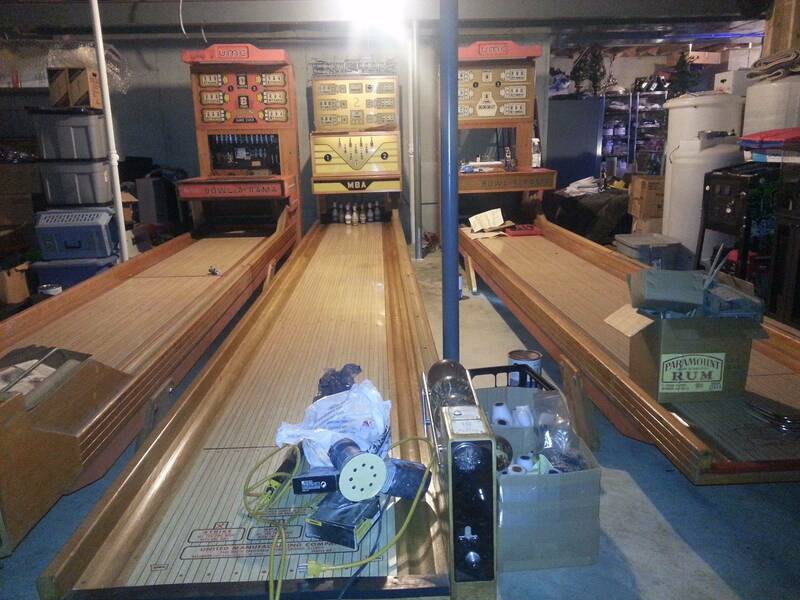 I am working on 5 of them right now (see pic of my basement of 3 of them). Score reels were froze stiff and same with pinsetters. I currently have the pinsetters off the Bowlarama's and am going through them now. I fun project that takes ALOT of time. The Bowl A Rama is a large ball bowler? Over 100 - You must have a vast knowledge base! The long lane and large ball, I'd have to agree, that'd be the best ever. I agree too, that repairing and restoring these machines is very satisfying once they work properly. I too like the 1962 to 1965 CCM switch lane bowlers. they offer a lot of features and easy of maintenance, especially compared to United. But my favorite bowlers are the 1960s Bally reciprocating contact ball bowlers. They made them from about 1963 to 1969, almost every year. They are a bit hard to find, but easier to find that say a Bowlarama. Frankly i think the hype around Bowlarama/MBA is over shoot. Again i prefer the Bally reciprocating bowlers, for a variety of reasons. The MBA/Bowlarama is neat, but they are freakly HUGE and parts are impossibly expensive. 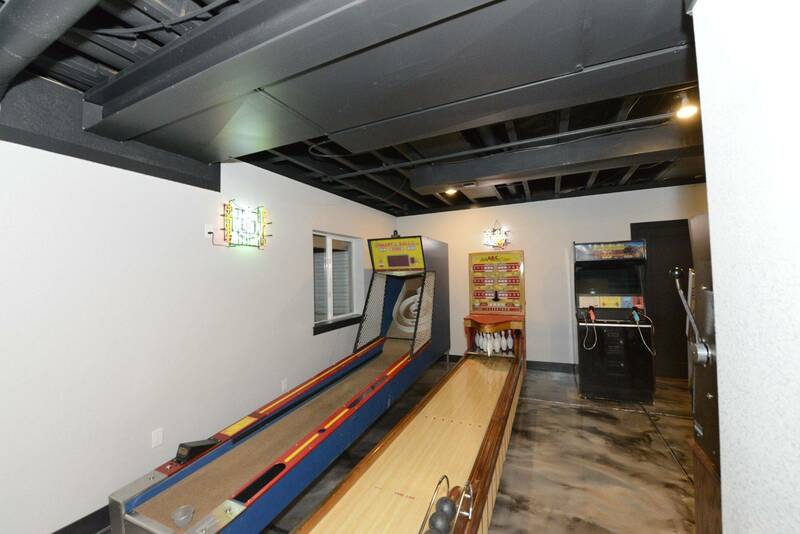 The Bally reciprocating bowlers are easier to deal with and have in a "normal" basement. And i think they provide the same experience (and are less expensive). Also the pins don't break in half when your drunk friends throw the ball too hard. My prospective on shuffle bowlers is they are worth nothing, or less than nothing if you don't personally want it for your collection. I received a Williams Taurus puck bowler as part of a group buy. It would partially boot and was in decent shape. I could not get a single offer for the machine, not $1. I am sorry that I did not have space for it, I would have kept it for fun. I ended up selling the boards, displays and coin door. The rest hit the dumpster. 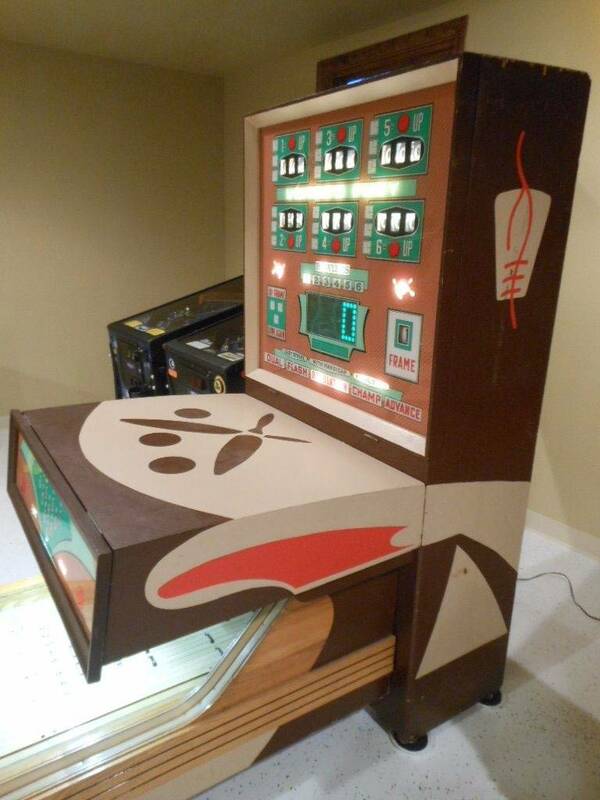 Considering the time and effort it took to move the machine and part it out the value was negative, the only satisfaction was I put some pinball parts back into the world. 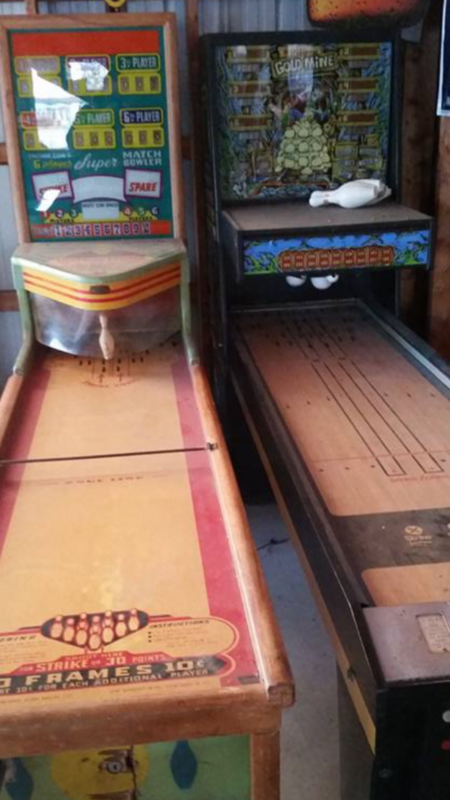 Here are a few pics of my bowler I have, it has never been in a bar or arcade only in a home. 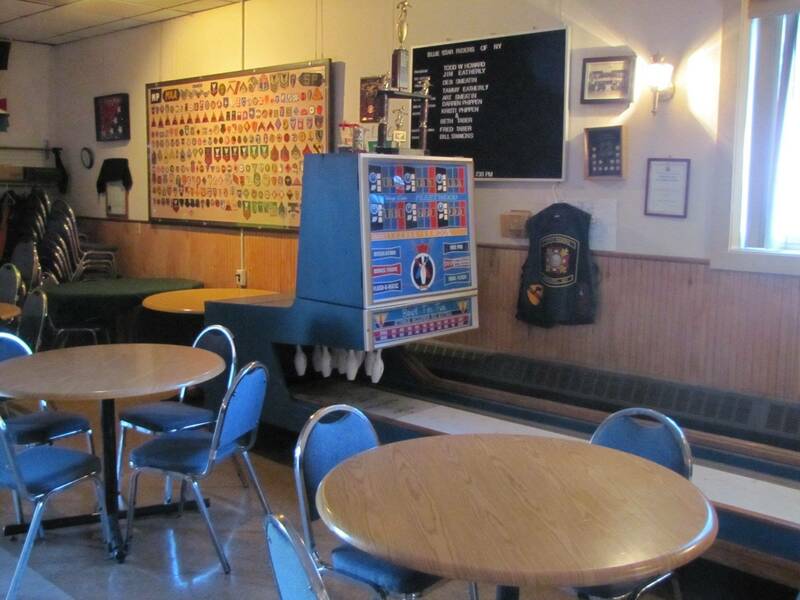 Keep in mind that location plays a HUGE part in pricing for a ball bowler. Out here in Ca they seem to be very rare, and I would guess even a non working one that is at least complete would bring about 1200 or so to start. My favorite contact bowler that blows them all away is the MBA/Bowlarama by United. I have owned over 100 bowlers and nothing comes close to the MBA/Bowlarama. These are definitely cool to play, but another downside besides not having the extra game versions (found on the 60's/70's switch style bowlers) as you mentioned, is that the pins take a beating and are expensive to replace. IF you can find them. Truly a rich man's bowler between the typical initial purchase price and the extra pins cost. One other thing - picking up a 7-10 split on them is basically impossible. A comparatively minor point, but still, a fun and challenging gameplay feature on switch style bowlers. Many of those puck bowlers can be bought stupid cheap. 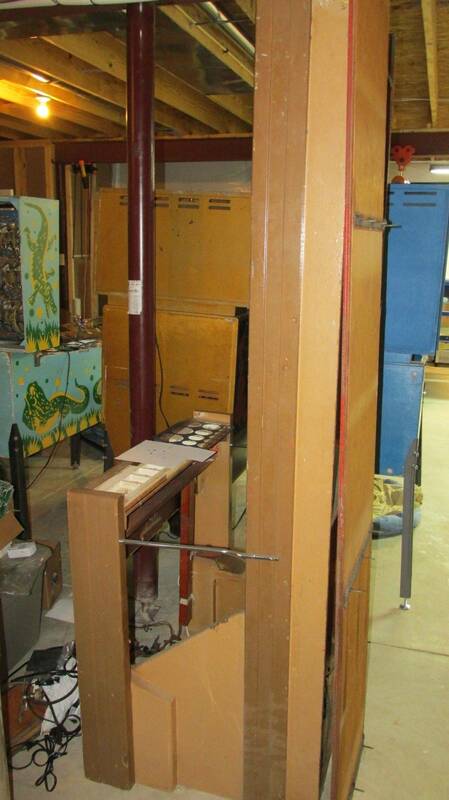 Keep in mind they have parts you can harvest and reuse in the full sized bowler machines. 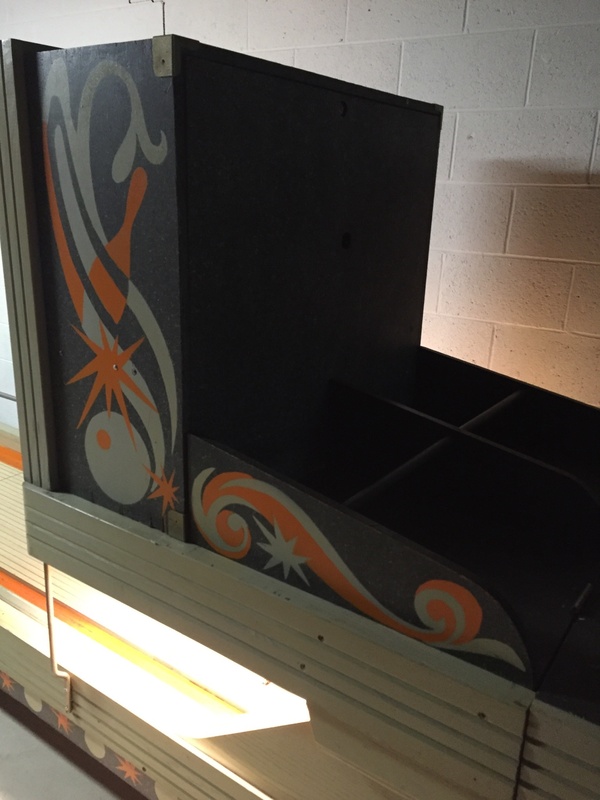 I'm looking at a 69 Bally contact bowler tomorrow 21 foot which is in pretty nice condition. Also have a puck alley I can pick up for a few hundred bucks which is obviously much cheaper but also much smaller. 21 feet is gonna be hard to fit but I feel like maybe I shouldn't pass on this. Looks great and working 100%. 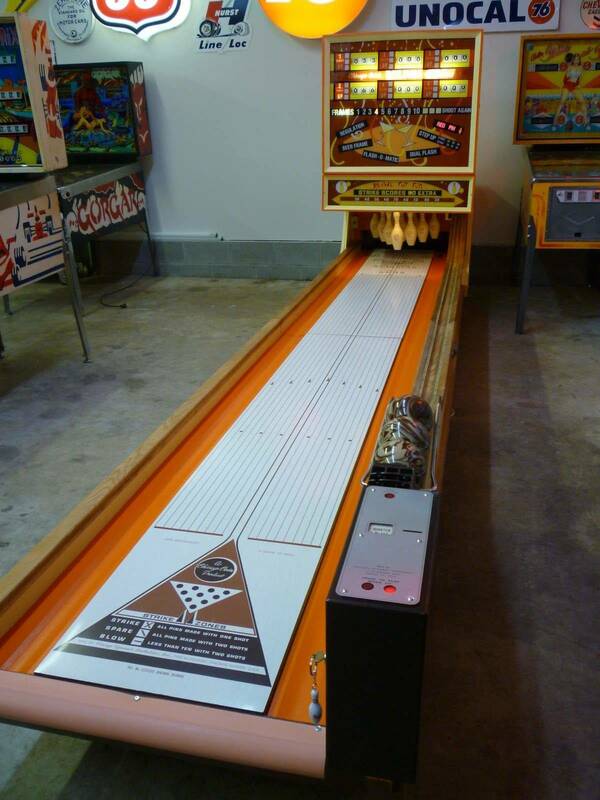 I've owned both and found the Bally very easy and boring compared to Bowlarama. That's why I sold the Bally contact and kept my MBA. Regarding parts, the pins and all chains are now available to buy new and these new ones seem impossible to break. 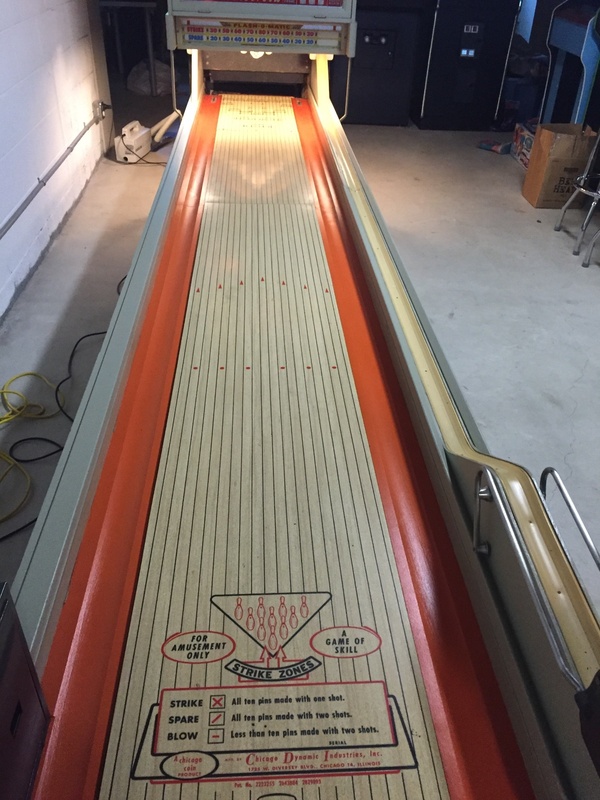 What parts are hard to find on Bowlarama? All backglasses are available, it's basically united guts. I am rebuilding one now and I think parts are easier now than they were a few years ago. I love my Gottlieb Strikes and Spares. 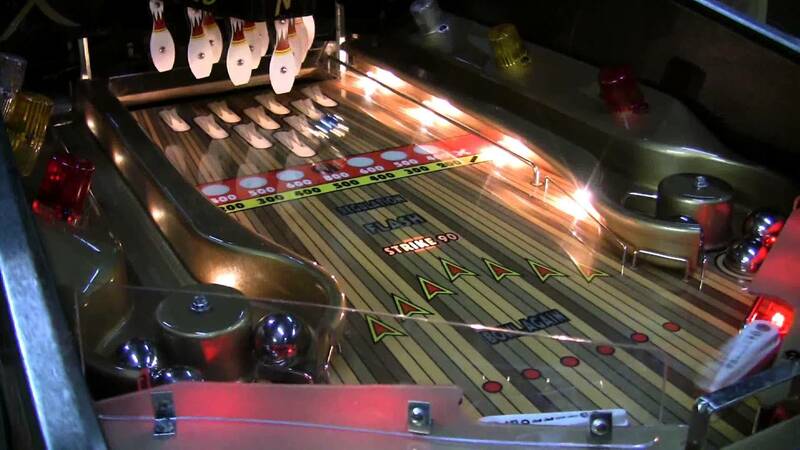 It has what must be the most beautiful playfield of all time. They only made 750 in 1995 just before closing the doors at Gottlieb, it's definitely different and the gameplay is fantastic. As for price, I believe it must be the greatest steal in pinball. I bought mine for $1250 from the original NIB owner and home use only, very little home use at that. It's a magnificent machine. I have 2 CC majestics - working on restoring the first. Someone had the bright idea to paint everything including the oak with about 8 coats of paint that I had to strip, sand, fill, repaint/refinish. How are the 70's Williams puck bowlers? About the same price range for them too, a couple hundred bucks or so? How are the 70's Williams puck bowlers? I love mine. While I think I would prefer a ball bowler overall, I like the fact that the puck bowlers, especially the 70's ones are on architecture I can somewhat understand, since I'm not knowledgeable with EM at all. Plus it's fast with the high speed wax, and a great filler for in between games of pinball. And they're a few feet shorter, I think 10 feet or so, which makes them easier to fit in a lot of places. I think they're probably a few hundred cheaper than the ball bowlers, based on what I've seen in my area in the last year. 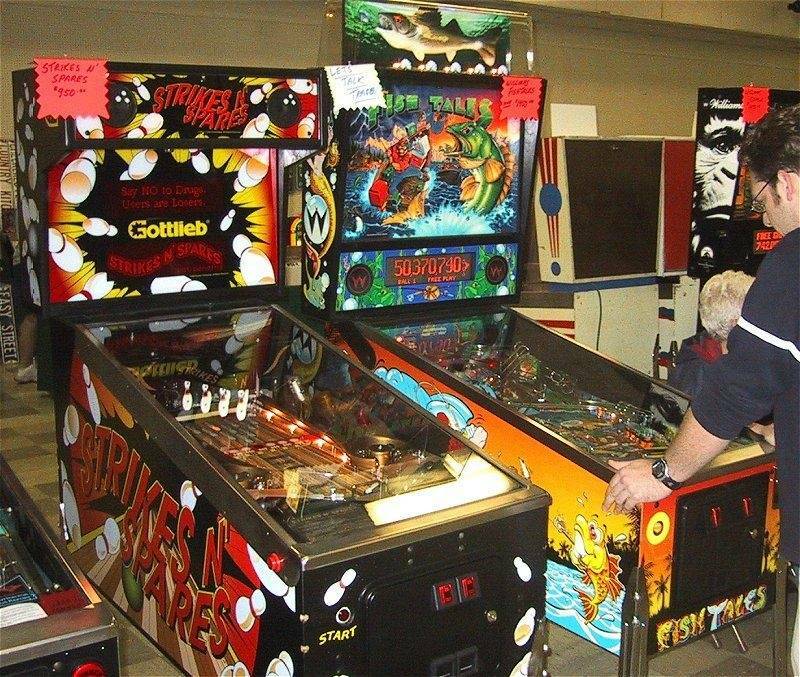 They're also nice for people who want to play games but are intimidated by pinball. Anyone have an opinion about what this bowler would be worth? It works, and is in nice (not perfect) original condition. for a Bally Lucky Alley because it's a nice machine. I paid $1,700 for my 1965 CC Preview bowler about 2 years ago. It was 100% working but a cosmetic mess. This one looks a bit nicer than mine, so I would estimate $2,000-$2,400? Of course, other factors will also drive the price - location, motivation of seller, etc. Good luck. Thanks for the information. Are these ball bowlers hard to move? Looks like the lanes come apart in a couple sections. Would this bowler fit in a pick up truck? Or I might have to get a trailer for it. Wow man your ball bowler looks great. 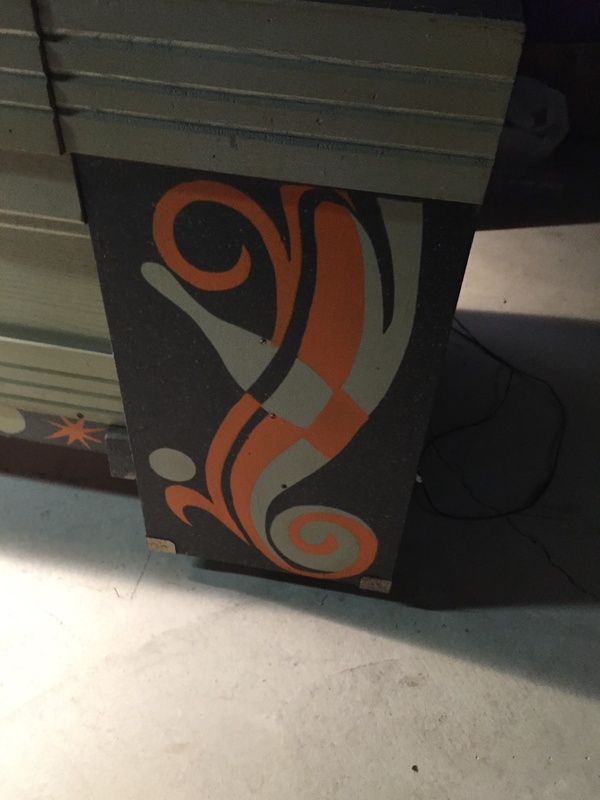 Now I am excited to restore this one I am getting soon. Yes. You'll need a trailer or rental moving truck. 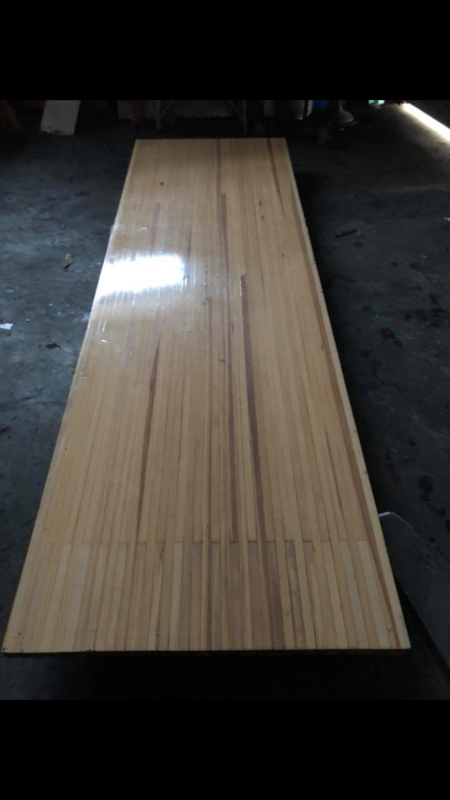 The lanes come apart, and the scoring head comes off, but the bulkhead where the pins are is attached to the lane setion, and is bulky. My thread details how i was able to seperate those two sections. In short, it's all bulky, and all heavy, even in pieces. but a trailer surely is more comfortable. It comes apart in 4 sections. lane section with the pins being the heaviest..
larger and more solid score reels..
Alright picked up this 16ft ball bowler over the weekend. This will be my next project, I believe this Sonic bowler was repainted at some point in it's life. 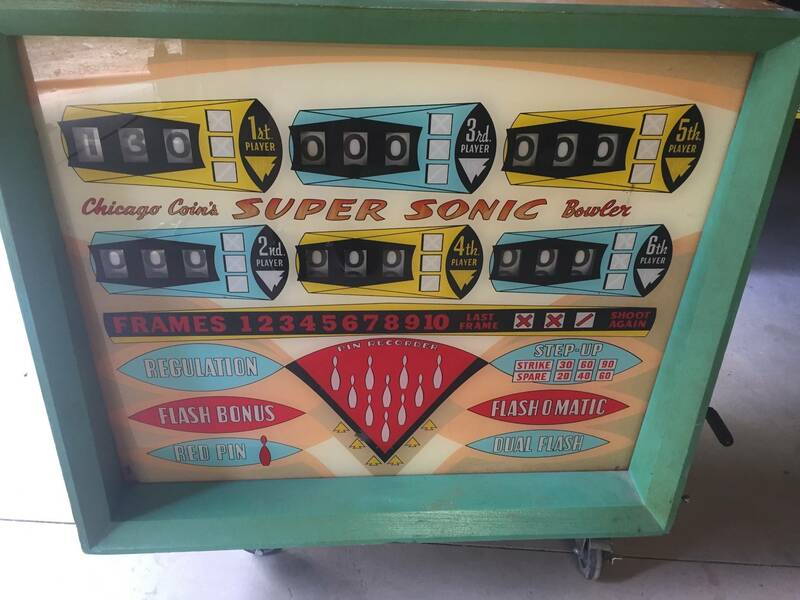 After talking with St. Louis Ball bowlers he said the color don't seem right for a Sonic Chicago Coin opt machine.. Either way I'll be doing a lot of sanding and repainting it anyways.. Looking for a Bowlarama/MBA especially a long one..
As the late Mike "Doc" Doom was fond of saying: "Big Ball Bowlers are like penises - the longer the better!". 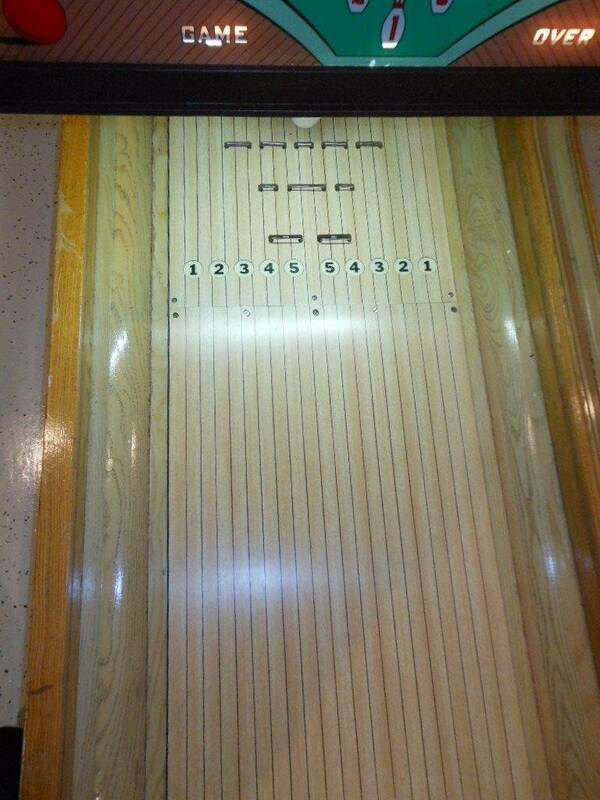 I miss talking to Doc about bowlers. 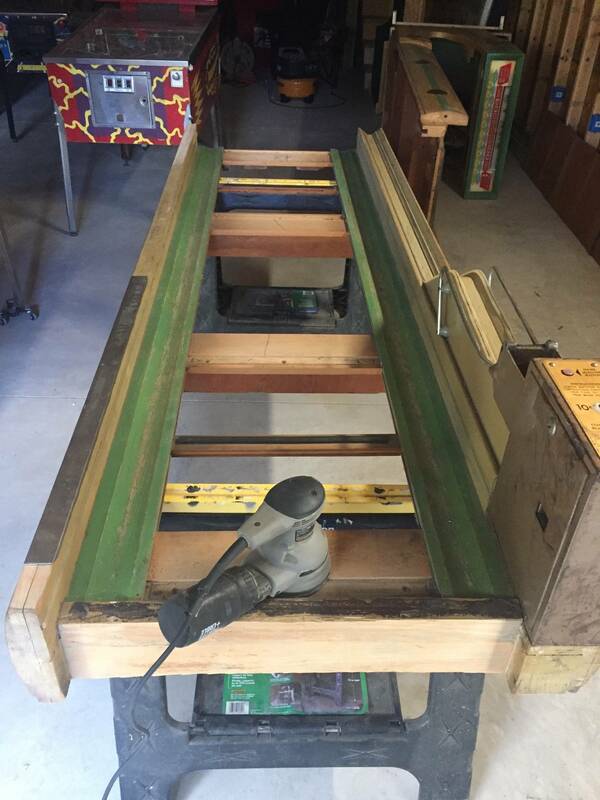 In his honor, rather than cutting down the extension lane he sold me for my Fleetwood BBB, I'm going to keep it as is in the hopes that I'll yet own a home that will allow my game's full 22-feet length to be enjoyed. If youre looking for a long MBA, you better have $15,000 for the base 20ft. and then another $1,000 for every extra foot you want. That's pretty much how it works on these. Your more like $1000 too $1200 per foot for a Bowl a rama. MBA...even more. Not many out there. Your more like $1000 too $1200 per foot for a Bowl a rama. with plenty of money (or at least enough) than there are Bowlarama/MBAs.